When it comes to drinking beer, do you have a preference on the vessel it’s in? Most of us grab a glass from our 'eclectic mix' of mis-matched options in the kitchen cupboard with little regard for the 'rules'. The typical rule is that ales are served in a jug or stein, and lagers in a slimmer, taller pint glass. Our pick of the best beer glasses is the LSA International Glass Beer Tankard. However, drinking is no longer just about the taste, but the glass by which it is consumed. Although it sounds crazy, many people prefer the taste of beer when it is served in a particular glass. I guess it’s no different to having your go-to mug for your morning coffee. Some of us want the nostalgic feel of a tankard or stein, whereas others are moving away from typical ‘laddish’ vessels, to more flamboyant glasses such as goblets and snifters. Now we’ve opened up a whole world of possibilities with a range of fancy glasses from around the world, everyone wants in on the action. If you’ve recently smashed your favourite beer glass or want to buy your dad a fancy new glass for Christmas, then take a look at the styles we’ve picked out below. Whether you’re a Guinness or a San Miguel kind of drinker, we’ve rounded up some of the best beer glasses 2018 has to offer that let you sip your beer in style. This sleek and sophisticated update of the classic beer jug is made using the traditional technique of mouthblown glass. Recommended for ale and bitter lovers, you can enjoy the smooth taste of your favourite tipple in this beautifully curved tankard. If a pint of bitter is your go-to drink of choice and you like the idea of sipping from something a little more elegant that your standard tankard, this is an elegant solution. It also comes presented in a gift box making it the ideal gift for beer-lovers. A classic tankard is a must-have for any beer drinker and these traditional tankards come in a handy set of 4 to ensure you’re never drinking alone. Whether it’s a bitter, lager or ale, these traditional dimpled steins are perfect for enjoying a classic British pint in the comfort of your own home. This is a manly mans beer glass with a classic traditional pub-style design that's perfect for chugging lager with friends. They are dishwasher safe making them easy to clean and great value for money for a set of 4. If you often have guests over for drinks, then these pilsner glasses are perfect for making not just beer, but cocktails too. They are just the right size for your favourite bottled beer and have a sleek and tall body with a wide base for extra stability when you’ve had a few too many. If you often find yourself drinking your favourite pilsner out of the bottle, upgrade to one of these Linz Highball Glasses. They also fit nicely in the dishwasher for quick and easy cleaning. If you have a glass drinks cabinet where your goblets are on show, these stylish tulip glasses are the best beer glasses to put on display. The best feature of these goblets in the tapered top of the glass, which helps to create a stable head on your beer. They also make drinking beer look elegant and whilst they only fit a modest half pint they are also suitable for ciders and soft drinks, too. Made in Germany, when you bring these glasses out, you can have your very own Oktoberfest in your living room. Be warned, the small stem can be tricky for anyone with large hands. This set of 6 snifters makes the best beer glasses for dark ale drinkers. Commonly associated with brandy or whisky, the snifter glass is thicker and allows you to capture the flavour of fuller-bodied ales and IPAs. This is a must-have set for having family over for Christmas drinks where sipping on high quality ales comes as standard. Plus there is the added bonus that they come as a set of six ensuring everyone is catered for. If you’ve got a drinking buddy then this is the ultimate gift for them. This pair of weizen glasses comes in a beautifully presented gift tube and they are made from lead-free crystal for sophisticated drinking. This style of glass is designed to keep the aroma of your favourite beer locked in, and the wider top is designed for head and volume. For those of you that are firmly in the lager-drinking category, you really should have a couple of these in the kitchen cupboard. If you are a Belgium Ale lover, you'll want a collection of these if the house. It might feel a bit overkill to drink out of a goblet at home, but if you want a sturdy glass that can hold a whole bottle of ale, then this is a great option. With its slightly aged design, it's pretty cool for lovers of the Dark Ages. This is a very heavy goblet meaning drinking your beer can be a bit of a workout but on the plus side, your kids won't knock it over as easily! If you know a keen beer drinker and you have been scratching your head about what to buy them for Christmas, you can't go far wrong with this Darlington Crystal Brew Glass. This ale glass is tulip shaped with a ribbed base meaning not only is it easy to grip, it also promotes the release of flavours in your favourite ale. Ergonomic and tasty! It comes beautifully presented in a gift box, making it a thoughtful gift for a mate. If you find yourself switching between lager, bitter and ale depending what mood you're in, you'll need to arm yourself with a set of glasses to suit all occasions. Enter the Spiegelau Beer Classics Tasting Kit. These are a set of the best beer glasses 2018 has to offer, so you can work out which one is your favourite. The set includes a tulip, pilsner, weizen, snifter and goblet, which can also be used for a range of other spirits and soft drinks. Ideal for the family drinks cabinet. 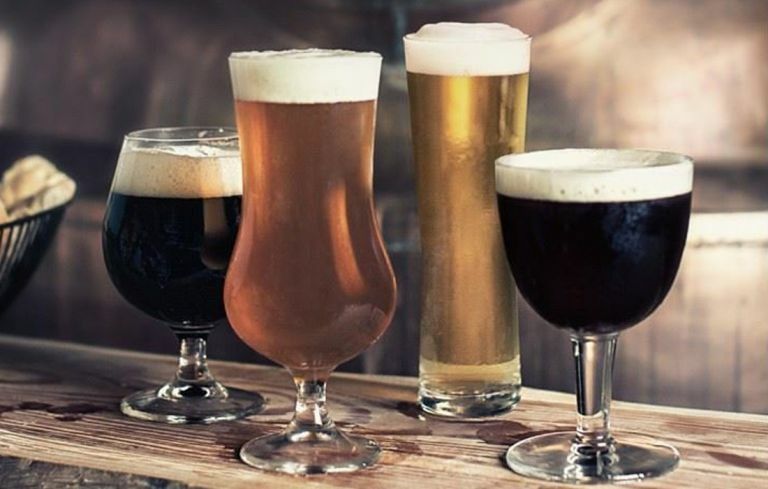 Fancy having a go at making your own beer now that you've got the right beer glass? Check out how we got on with our own beer brewing mission.